I’m no good at cryptic crosswords. I’d like to think this is because I didn’t do them as a kid, but then I never felt any inclination to do them as a kid. Where there’s no inclination, there’s often no ability. Either way, it’s a pity, because cryptic crosswords can be great fun. The fun lies in playing with words and ideas in a light-hearted way. Rather like reading the books of the writer this review is about. His name is concealed in the cryptic clue above. If you haven’t worked it out, don’t worry, because I wouldn’t have either if someone else had invented the clue. So let’s take it a step at a time. Who was a dubious disciple? Well, he was a bit more than a disciple, but “apostle” didn’t alliterate (among other things). My saying that should allow you to work out that the first word is THOMAS. Now, forget about the bit in the middle and concentrate on the bit on the end. “Ornithology” is bird-study, so “ornithophilia” must be bird-love. And it’s proud. But is that “proud love” or “proud bird”? My asking that should allow you to work out that the third word is PEACOCK. Now let’s try the bit in the middle. A disciple of Tarzan called Thomas is expressing his love for peacocks. How might he go about it? Well, how did Tarzan go about expressing the same emotion? Tarzan love Jane. My explaining that should allow you to work out that the full answer is THOMAS LOVE PEACOCK. He sounds like a ’sixties psychedelic band, doesn’t he? Maybe he was – if he wasn’t, he should have been. First and foremost, though, he was a writer, born in 1785, died in 1866. In Weymouth and London, respectively. He was only a minor literary figure even in his day, but that’s part of what I like about him. That and his name. And his books. Well, two of them, anyway. 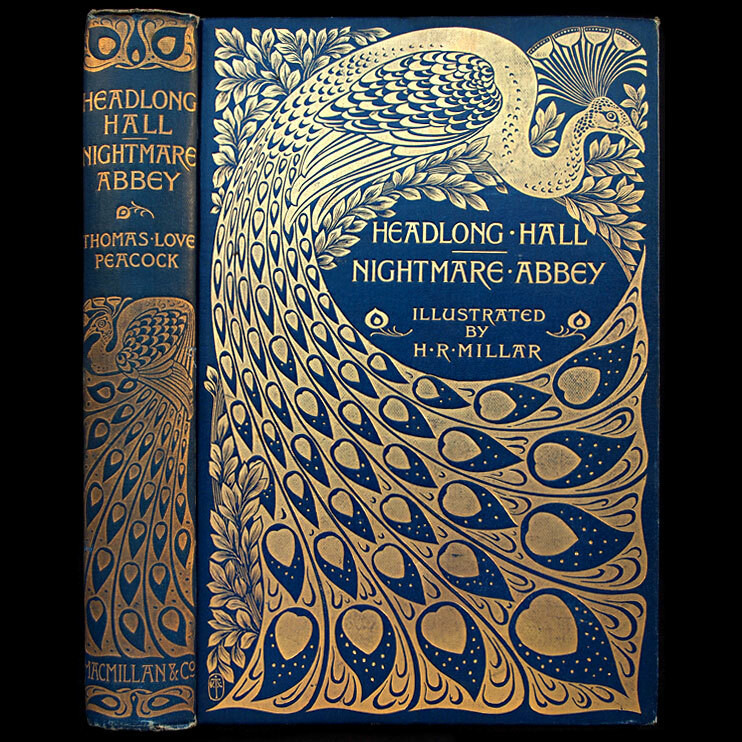 He wrote seven-and-a-bit: Headlong Hall (1816); Melincourt (1817); Nightmare Abbey (1818); Maid Marian (1822); The Misfortunes of Elphin (1829); Crotchet Castle (1831); Gryll Grange (1860); and Calidore (which he never completed). I’ve tried four of them, and given up with two. The two I gave up with were The Misfortunes of Elphin and Crotchet Castle. The two I didn’t give up with were Headlong Hall and Nightmare Abbey. I have often debated the matter in my own mind, pro and con, and have at length arrived at this conclusion – that there is not in the human race a tendency either to moral perfectibility or deterioration; but that the quantities of each are so exactly balanced by their reciprocal results, that the species, with respect to the sum of good and evil, knowledge and ignorance, happiness and misery, remains exactly and perpetually in statu quo. Throw in more philosophers and scholars attached with equal fervor to other, and odder, world-views, mix with absurd incidents, absurder love-affairs, and season with genuine learning and wit, and you have the recipe with which Thomas Love Peacock has appealed to a small but select audience ever since Headlong Hall was first published in 1816. Two years later, in 1818, he followed it with Nightmare Abbey, which is less a feast than a single dish, but no less delicious for that. Even better, you can buy both for a pound in the Wordsworth series at a bookshop near you now.